Originally founded back in 1988 as Midiman, the brand started trading as M-Audio in 2000. M-Audio delivers cutting edge technology, combined with completely easy to use and affordable products aimed at making music for accessible and easy to do. 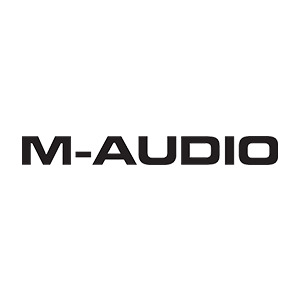 The M-Audio range spans everything from controller keyboards, audio interfaces, to studio monitors and microphones. Combine all the production power and performance you need to get the most from your music software and MIDI gear. Feature-packed USB audio/MIDI interface the M-Audio 8x4m! Available in 25, 49 or 61 key models, the Oxygen series puts together a velocity-sensitive keybed with a series of 8 trigger pads. B-Stock, never used good as new missing 12v PSU original packaging worn. A premium, no-compromise keyboard controller, ideal for professional or semi-pro players. Successor to the industry-renowned BX D2 monitors, enabling you to hear every detail and improve your mixes. M-Audio CX8 (pair) (EX-DEMO) Ex-demo monitors with a few surface scratches on them.